Potclays has hosted a comprehensive programme of courses & workshops covering many aspects of ceramics for over 35 years, attracting a wide audience ranging from the complete beginner to professional practitioners. Many of our courses are especially useful to teachers, tutors and technicians working in primary, secondary, further & higher education. We carefully select the most respected, knowledgeable and qualified hosts to present our courses and seminars. In 2016 Potclays was awarded the CraftCourses.com Platinum Certificate of Excellence for our programme of courses & workshops. We usually hold two showroom sale events each year - one in February and the other in late September/early October, to coincide with our Annual Open Day. Our Open Day is a unique opportunity to see our working factory and find out where your clay comes from. We also run exciting hands on activities and mini-workshops. Sign up to our mailing list to stay informed. Full details released in mid January: SIGN UP HERE to our mailing list to be kept informed. Book exclusive Mayco workshops during Sale Week here. Please book early to avoid disappointment. This is a very popular course and due to the intensive nature of the tuition, places are restricted to a maximum of 10. Please read full event information on our Eventbrite page before you book a place. Full information about our courses including booking terms can be found on our website. For directions to front entrance please use ST4 6JW (enter no. 447 if prompted by your device). 6ft10” height restriction at front entrance. Please contact us to make special access arrangements if your vehicle is over this height. This two-day intermediate level hands-on course will guide you through the process of plaster mould making for slip casting. 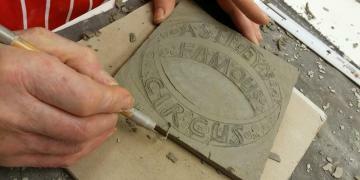 Fast-paced and informal, Ed will demonstrate various techniques from the preparation of a shape to produce in ceramic to the making of a plaster mould from this shape. A slipcasting demonstration will also be given together with the opportunity to practice this technique using ready-made moulds. On the first day please bring with you an object you would like to make a mould from, if you can visualise making a one or two part mould from it and its no larger than approximately 20cm it should be ideal. 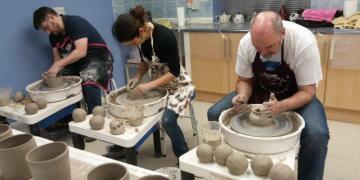 At the end of the course you can then take your completed mould home to dry out before taking slip-casts from it. Ed Bentley is an award-winning shape designer and product developer with over 30 years experience within the global ceramic industry. Ed teaches at degree level nationally and runs his own mould-making courses from his workshop in Staffordshire. Included: Tool kit worth over £55, course materials, lunch, refreshments, preferential discounts against all of our products. 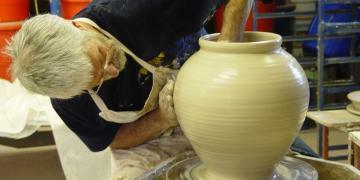 Introduced in response to popular demand, this is a two-day intermediate level course will allow you to hone and build upon basic throwing skills, and learn about creating more complex multi-part forms such as lidded vessels and teapots, including trimming/turning and finishing. To attend this course you should be able to centre and throw a 6" cylinder quickly and comfortably. 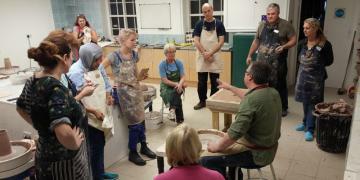 This outstandingly popular advanced level course has been extended to three days of intensive tuition, and will cover all aspects of throwing with practical demonstrations and hands-on sessions using Shimpo Whisper potter’s wheels. You will throw a wide range of bowls, platters and jars as well as lidded forms. David will deal with many aspects of surface pattern direct onto the newly thrown form, including faceting, paddling and rope-impressed design. He will also demonstrate two-piece throwing to enable bigger jars and bottles to be made. To attend this course you should be a 'proficient thrower' able to comfortably and quickly throw a range of basic, medium sized forms. David Frith is one of the most respected of Britain's active potters. He has travelled extensively; teaching - both pottery and kiln-building, giving exhibitions and holding workshops. Included: Tool kit worth over £94, course materials, lunch, refreshments, preferential discounts against all of our products. Two intensive days of demonstrations and making that will cover fundamental handbuilding and modelling skills. Working practically with hollowed forms, coiling, slabbing and coloured slips, Jeremy will help you to design and make a sculpture to either take home or that can be left to be fired at Potclays. 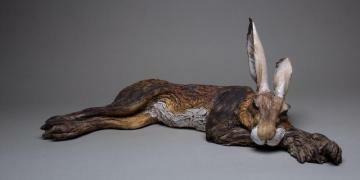 Using ‘the hare’ as a theme you will be shown ways to make exciting, dynamic and lively versions of this animal. Capturing the essence of the creature will be emphasised throughout the workshop. Jeremy James is a well-known, award-winning ceramic sculptor. He has taught and operated a professional sculpture studio for 30 years, exhibiting his work in the UK and internationally, and his work is held in numerous public and private collections worldwide. A special three-day intermediate to advanced level masterclass with Richard Heeley, focusing on throwing, turning and decorating porcelain. Richard will discuss the characteristics, technology and history of porcelain, demonstrating techniques and strategies for success in throwing and turning. Richard will also demonstrate his blue and white under glaze technique, focusing on brushwork, mark making and pattern design using cobalt pigments. Included: Tool kit worth over £128*, course materials, lunch, refreshments, preferential discounts against all of our products.